On Fathers day, I made this cake for Bella and her cousin who is also top-8 free. After I served the kids, my brother jumped in. He bypassed the “regular” chocolate pie and s’more pie and devoured this hot fudge cake. He litterally ate the rest of the cake! The cake has since become a regular dessert at our house. I typically avoid baking with rice flour because it usually leads to a grainy textured product. I am amazed at how this cake doesn’t taste grainy at all! 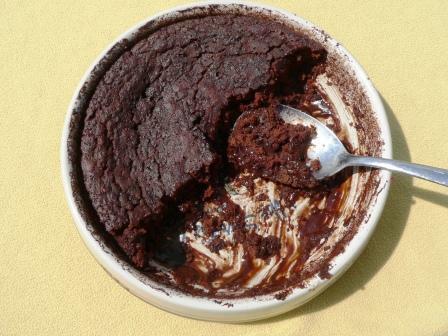 The moist chocolate cake swims in a puddle of rich chocolate sauce. We love this served warm with vanilla ice cream. Make chia egg: In a small bowl, combine chia seed and water and set aside to gel. Make cake batter: In a large bowl, whisk flour, sweetener, cocoa, baking powder, baking soda and salt. Stir in coconut milk, oil, vinegar, and vanilla extract and set aside. Make chocolate Sauce: In a small saucepan, heat water to boiling. Remove the water from the heat and add cocoa, salt and sweetener. Mix until combined and set aside. Add chia egg to cake batter and combine well. Transfer the cake batter to a pie dish or 8 x 8 x 2 pan and spread evenly. Pour the chocolate sauce on top of the cake batter. Bake 40 minutes or until a toothpick inserted in the cake topping comes out clean. Let cake cool 10 minutes before serving. Thanks The Nourishing Gourmet for this recipe! You may also enjoy Chocolate Fudge Cake or Chocolate Frosted Rice Krispie Treats. I agree that rice flour can be gritty but I’ve found it a lot more reliable than other flours at the same time. I usually mix it with other flours and starches like sorghum and tapioca, which reduces the grittiness. This recipe looks so good – a lot like a “regular” one I used to make. I will have to give it a try! Wow! I make this one with all the allergens. Never thought an allergy free one was possible. Have to check into chia seeds. Couldn’t wait to try this when you first posted it. Just now made it with one of my daughter’s. Just realized I didn’t thin the coconut milk. Ooops. Can’t wait to try it! April, That shouldn’t be a problem. It will be a little more rich. I hope you enjoy it. Thanks for leaving a comment. It really encourages me. It’s really yummy. The kids like it too! Do you know if a flax meal egg would work in this or just chia? Thanks! Isn’t coconut a tree nut? My little guy has a problem with tree nuts ( I know that from nursing). That’s a great question Lauren! Coconut is a fruit. Actually, some say it’s a seed. But the bottom line is it’s not usually grouped in with tree nuts. That said, you can be allergic to coconut just like everything else, so you might want to ask your doctor if it’s safe for your son. Does this cake reheat well? I’m going to a dinner party tonight and wanted to bring this along. Any sub for the rice flour? I’m allergic to gluten, rice, corn, nuts (among other things) which rules out a lot of things. Great!!! Made this for my daughter-in-love who is eating gf/dairyfree/and eggfree because her precious baby needs to stay away from all three. Happy to be able to make something yummy for such a precious mommy to our grand-daughter. Sounds like she is blessed to have you in her life!